Summary: Regardless of the hype, 8 Mile is a classic underdog tale with real bark. Inevitably touted as Rocky meets rap, it’s easy to see why 8 Mile has drawn comparisons with Stallone’s muscular slug-fest. More economical with its (verbal) punches, yet equally compelling in its showdowns, washed-up white trash again suffers and succeeds to make it in a black man’s world. 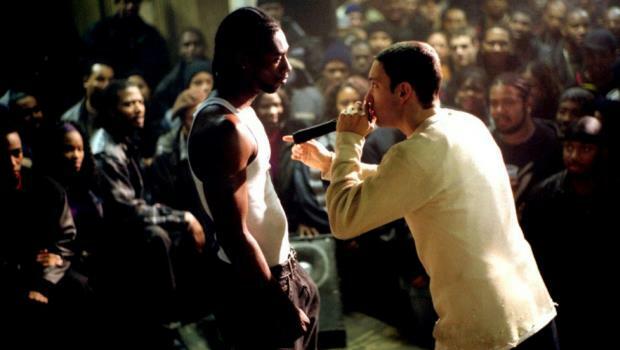 Neither as dumbly jingoistic or as memorable as Rocky’s exploits, in Jimmy “Rabbit” Smith, 8 Mile nevertheless has a central character who has the audience rooting for him from start to finish. Rabbit is prodigious, dumb, nervous, angry, vulnerable, caring, rash, brooding and stubborn. But Eminem he ain’t. Rather, in a testimony to Marshall Mathers’ acting ability, Rabbit looms large and real – some achievement when you consider Eminem’s eminence in the public consciousness. Ok, so he might only be playing himself. And yes, further roles may prove him a one-trick pony. But on this evidence, he’s a genuine screen thoroughbred and a better bet than say, Madonna, or lá Lopez, whose personal egos routinely obscure any character they portray. Whilst no-one doubts the size of Eminem’s self-regard, this is a restrained, twitchy performance, ensuring that the film’s rapping duels are as much a cathartic release for the audience as they are for the hero. Living in Detroit, near the 8 Mile road – a part of the city that separates whites from blacks – we first meet the nerve-juiced Rabbit vomiting before a rap battle at the Shelter club. Unable to respond to his opponent’s insults, he chokes and flees the scene without uttering a line, returning to the drudgery of factory work and living with his trailer-trash mum (Kim Basinger) and younger sister. Hanging out, he gets increasingly angry with his rag-tag assortment of friends, yet they remain convinced of his writing and rapping talent, in particular Future (Mekhi Phifer), the rap battle host. In the meantime, his desire to escape his circumstances finds resonance with the feisty Alex (Brittany Murphy), and they do some pretty full-on resonating behind machines at his factory. But rapping is Rabbit’s true love, and when he says to Future, “something’s got to happen soon”, you can’t help but agree, because director Curtis Hanson has built to his finale with excruciating timing, peaking at just the right level of tension for the anticipated lyrical onslaught. That said, there are some niggling irritants, particularly in the script, that might derail a less self-assured movie: boozy, self-pitying Basinger saved from ruin by the redeeming force of bingo; mic-fodder bad guys line-up for knocking down like eager-to-please Weebles; and a gay character is introduced apropos of bugger all, prompting Rabbit to rap about how it’s ok to be gay, because it’s not as “gay” as doing a dead-end job your whole life. One for the pink Oscar vote that. But there are multiple redeeming features: Hanson envelops Detroit in a steely, dirty light that fosters a real sense of social deprivation, yet the film is shot through with humour, mostly at Rabbit’s expense. His friends add lightness to the dark spark in their midst – one of the best scenes in the film has Future encouraging him to sing “I live at home in a trailer” to the tune of “Sweet Home Alabama”, and Phifer is consistently the rock the script requires him to be. Murphy though, is even better. Alex has a relatively small role, but like Rabbit, we see little else when she enters the room, so alluring is her ambition and sexual presence. Best of all though, are the raps. You don’t have to be a fan of the genre to appreciate their wit, and like any great fight sequence, the spectacle lingers long in the memory. Regardless of the hype, 8 Mile is a classic underdog tale with real bark.